Passport to Houston is a program that was created in 2007 by President David Leebron. It is designed to engage the Rice community with the city of Houston in order to encourage students to be more community-oriented, socially-engaged, and culturally-aware. The RPC Passport to Houston Committee identifies and builds relationships with regional institutions that offer students educational and cultural opportunities for intellectual, social, and professional growth. The Passport program promotes and highlights these organizations by providing free or discounted admission. What does Passport to Houston offer? With a valid Rice ID the Passport program also provides (1) unlimited access to the Museum of Fine Arts (for undergraduate students only), (2) unlimited access to permanent exhibitions at the Houston Museum of Natural Science (for undergraduate students only), and (3) unlimited access to the Houston Zoo. Read the FAQs for additional information and terms of the program. Students are also invited to attend Rice Night Events sponsored by the RPC Passport to Houston committee. These events are free to undergraduate and graduate students with tickets distributed through each college and the Graduate Student Association’s Arts & Entertainment Committee representative. Please join the Passport to Houston Facebook Page for up-to-date event information. Rice undergraduate students can obtain a METRO Q Card for unlimited use on regularly scheduled METRO transportation systems, including the light rail, during the academic year. Graduate students (excluding Jones School) are eligible to purchase Metro Cards with a value of $500 for $55. Metro Q Cards for undergraduates and graduate students are available from the Cashier’s Office in the Allen Center. Undergraduate Metro Q Cards can only be obtained and replenished during the academic year. 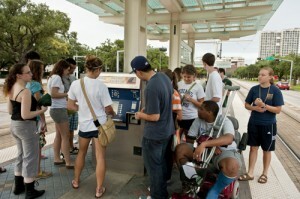 ALL Passport to Houston events are accessible by Metro/Light Rail. Your Passport to Houston committee co-chairs are Isabella Garza and Megan Wong. If you have any questions, comments, concerns, or general feedback, please email passport.rpc@gmail.com.